Divine spot in between the countless castles along the rivers Indre, Cher, and Loire. 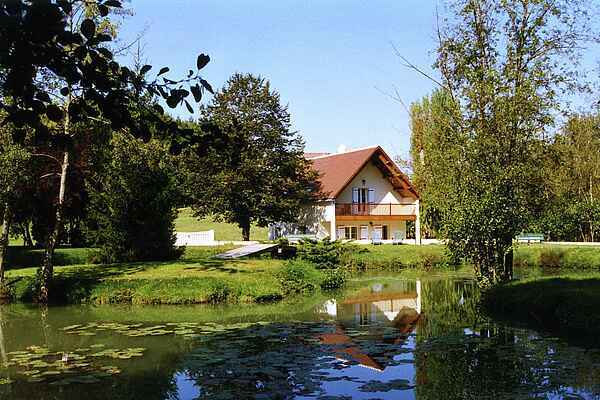 This holiday house in Faverolles-en-Berry is an ideal base to discover the many beautiful sites nearby. The house's interior is well maintained and atmospheric; in the living room you'll find a lazy lounging area near the cozy fire place. The bedrooms overlook the beautiful area of the house. Included is a gorgeous, fenced garden with lawns and shade trees, providing complete privacy. The fishing pond won't be dangerous for children, since the terrace is fenced. At 300 m from the house you can acces several shared facilities, including a jeu-de-boules court, tennis courts and a large heated pool. At 500 m you'll find a bakery and a grocery store. There is a restaurant in Luçay-le-Mâle (8 km). Forests with many options for hiking and biking: Forêt de Brossard (5 km) and Forêt de Gâtine (8 km). Zoo (de Beauval), pedalboating on the Char, rent-a-bike, supermarket, and a market in St. Aignan (15 km). Swimming lake near Chemillé-sur-Indrois (20 km). Castles along the Indre between Loches (35 km) and Châteauroux (55 km).